Food is artwork at Per Se, as the presentation is thoughtful and executed with perfection. Beautiful white plates of various shapes and sizes perfectly complement the food. Salmon Tartare ice cream cones are presented in a silver holder, so as not to have to lay the cone on a plate. 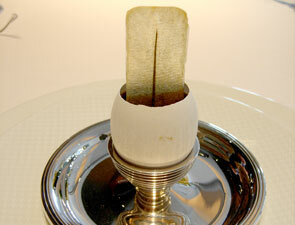 A Panna Cotta with Black Truffle Oil is presented inside perfect egg shells. The presentation goes on and on. And by the way, although it says you're getting a nine-course tasting menu, by the time you're done, you'll have experienced at least 12 different taste sensations, and 12 vastly different presentations. So sit back, relax and enjoy the show. The dramatic floral arrangements placed strategically throughout Per Se are created by Lotus, Luis Collazo's New York-based firm. The arrangements combine branches and unusual flowers in dramatic reds, oranges and pinks, which are the perfect contrast to the chocolate, caramel and cream tones that are so prevalent throughout the restaurant. 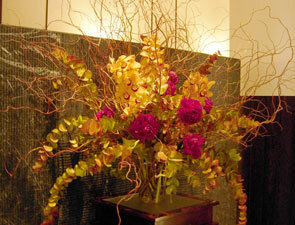 It is apparent they these arrangements are created with painstaking precision and a lot of love. Smaller, but no less beautiful, cream-colored flowers adorn the tables.